PeeWee & Charlene at Natchez State Park, Natchez, MS. 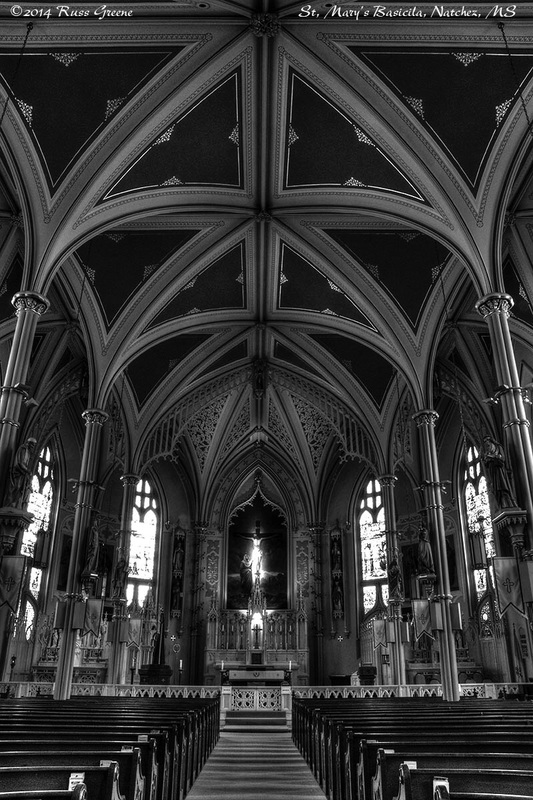 Inside St. Mary’s Basilica in Natchez, MS.
4 bars, LTE. I didn’t try but should have been able to make calls using Skype. Email and using the web were possible and worked well. RESTROOM RATING: Fail (I assign a Pass or Fail rating based on many considerations including: cleanliness, usability, hot water availability, hand soap availability, ease or difficulty of use, condition and function of fixtures, if using the restroom is a pleasant or unpleasant experience, etc.) There were two mens’ toilet stalls in Campground B where I stayed. Neither door could be locked. A drain between them was above the low point and water from a shower with a blocked drain puddled there making it impossible to keep your pants dry when sitting. Gross. Other than that it was OK.
SHOWER RATING: Pass (I evaluate showers in a similar fashion to restrooms. See above.) I used the handicap shower in Campground B. Apart from there being no shelves upon which to place anything it was OK. 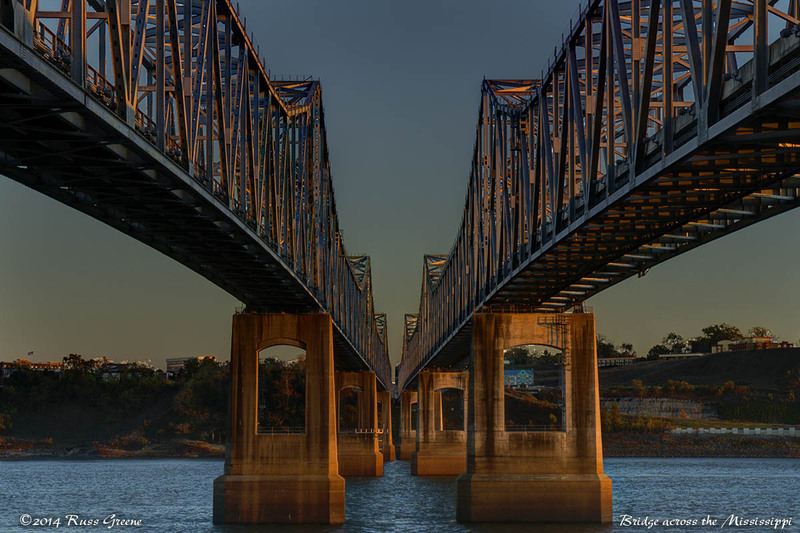 This view shows an unnamed bridge that crosses the Mississippi from Vidalia, LA to Natchez, MS. Here, we look toward Natchez at sunset. 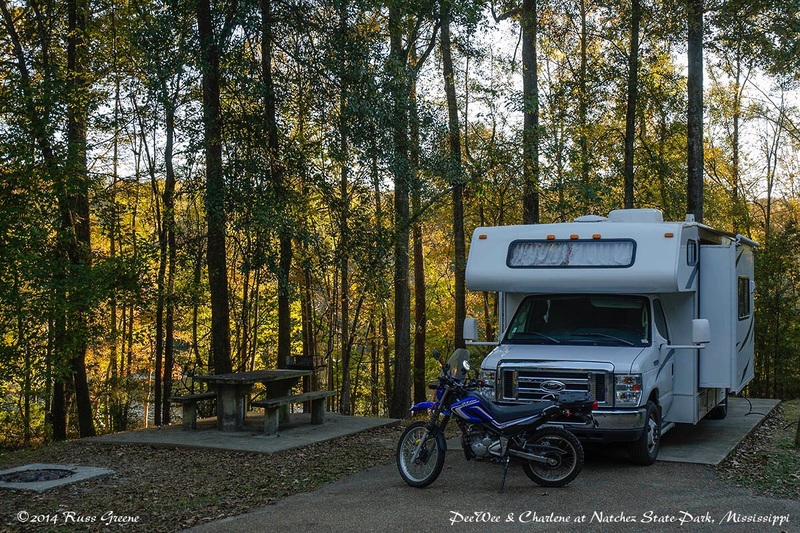 Propane: There is nothing nearby according to AllStays if you search just for propane but River View RV Park across the Mississippi in Vidalia is listed has selling propane when you search for nearby campgrounds. There may be other places. This is a fairly nice campground. I stayed there 6 nights on my way south from Minnesota to New Orleans on my See-the-USA-in-an-RV trip. It is wooded with good shade, especially in Campground A. I should say that Campground B is closer to the lake. Campground A is probably a mile up the road. It has an even more wooded feel than Campground B. It is nestled among tall trees. I stayed at Campground B but walked over to A to have a look. I visited the restroom there and discovered the men’s toilet has but a shower curtain instead of a door. I don’t like anything but a locking door. There is boating on the lake and fishing too, including at least two fishing piers that I saw. There is also hinting in the area, and not all that far from the campgrond! 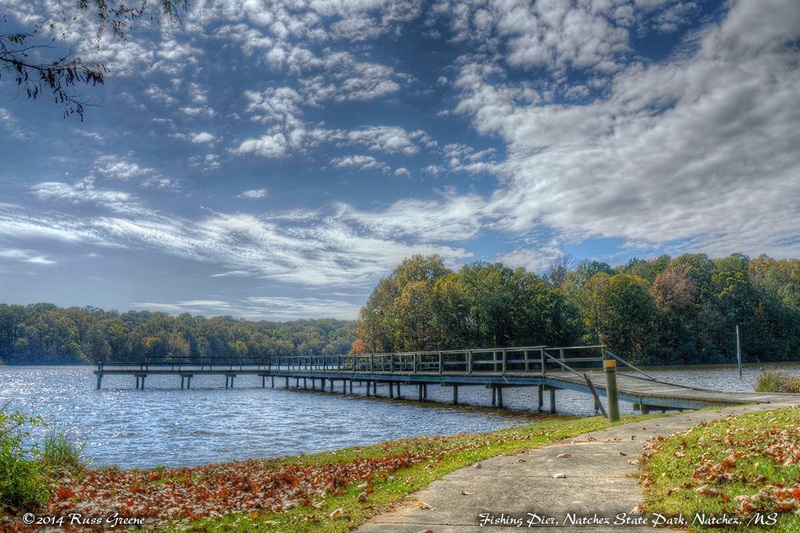 The park is about 30 minutes from Natchez which has a sad and interesting history. I say sad because, like many other places in the south there was slavery there before it was abolished. In part that’s also why it is interesting, but there’s more than that. The town is right on the Mississippi river where paddlewheel boats reigned supreme back in their day. A photographer and his son that followed in his footsteps documented the town and its people along with the riverboats beginning about 1875. Many of the negatives survived and an excellent exhibit has been created from them at the First Presbyterian Church. The exhibit includes portraits where the men and the ladies posed formally in their finest period costumes and hair styles. 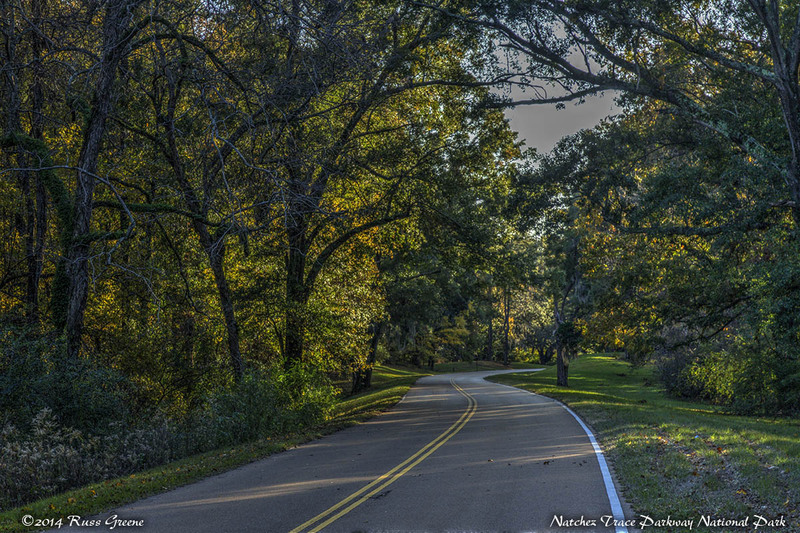 Natchez Trace Parkway runs by near the park. It is a 444 mile road running from the Nashville TN area to Natchez. It’s a national park and truly is a park-way. The road-park has a buffer zone on either side and the 60 or so miles of it I drove to get to Natchez State Park was just wonderful–forested on both sides with manicured grass where the trees didn’t grow to roadside. The speed limit is 50, there is one lane in either direction, there are no shoulders to speak of, and virtually no traffic. Just delightful. This is what driving should be. It’s where I first encountered Harrison Brown who was riding his bicycle from Alaska to Florida. Note: The following spring I drove a little more than half of the Trace from the Jeff Busby Campground to Nashville, staying at both Jeff Busby and Meriwether Lewis campgrounds along the Trace. We bought propane at a small propane place on west side of hwy that goes into Natchez from the park. Sorry, but can’t remember the name of it… May have been Natchez Propane..but the are several propane locations listed on web. Your photography is stunning, and I *love* all the campground details…super helpful. Natchez is one of my favorite places. I hope you went out to the Windsor Ruins and ate fried chicken at The Old Country Store in Lorman, MS (near the ruins). If not, turn around and head back! I didn’t catch the country store or the ruins… this time, but maybe I’ll return as I head east in the spring. Thanks for the tips!